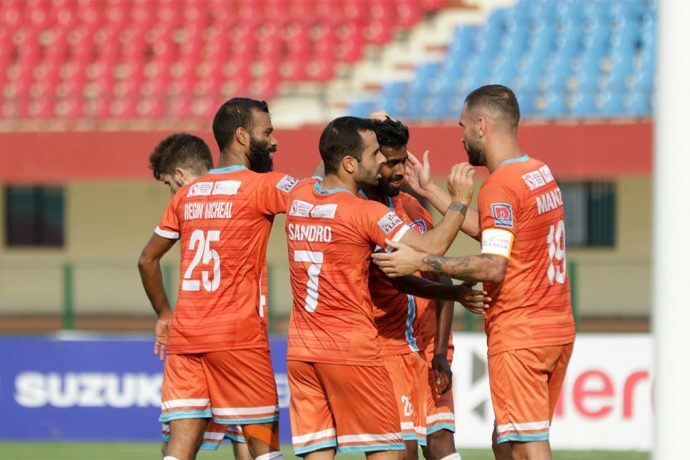 Chennai City FC regained the top spot on the 12th Hero I-League point’s table defeating Indian Arrows by two goals today at the Kalinga Stadium, Bhubaneswar. Chennai drew first blood in the 71st minute through Spanish midfielder Sandro’s free-kick and concluded their game with another goal from substitute Vijay N during the on time (90’+1). A beautiful header from Chennai City’s Manzi, that was called off-side was saved by the Arrows keeper Samik Mitra. A second opportunity came the visitors’ way when a confusion within the Arrows area led to Jitendra almost heading in an own goal, but thanks to an alert Mitra, the young Arrows were saved from an embarrassing moment. Their efforts finally paid dividends when a silly tackle in the 71st minute from Indian Arrows from the edge of the box, led to a yellow card for Suresh Singh, gifting the visitors a free kick from a dangerous spot. Chennai’s Spanish midfielder Sandro R made no mistakes thereafter, as he stole the opportunity, ensuring that this time the ball sailed into the goal.